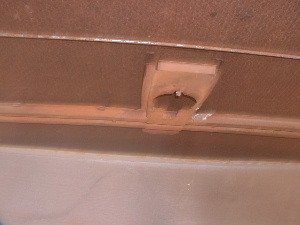 1956 Chevrolet Belair headliner installation guide. 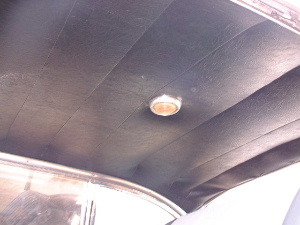 This is a 1956 Chevrolet Belair with a bow style headliner -- these pics are to show the process for installing a headliner in the older style antique and classic cars. 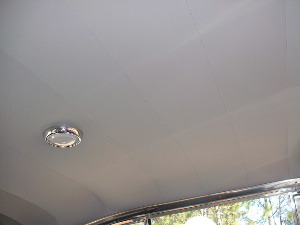 This headliner has 8 panels, 7 metal rods for installing the headliner. 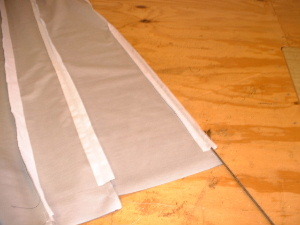 This technique will work for any bowstyle (sewn panel) headliner. You can find the headliner for the 55-57 Chevy Belair at these links. 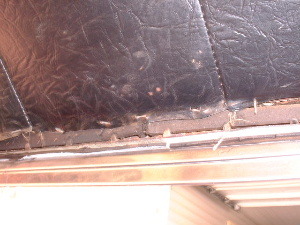 Remove the old headliner; remove the trim, visors, dome light, clothes hanger hooks, etc. 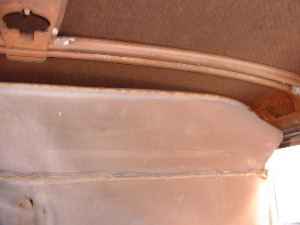 Most bow style headliners are stapled or glued around the edges. This pic is to show the bows; if you don't have a headliner in your vehicle; just measure from bow to bow to use the order form. 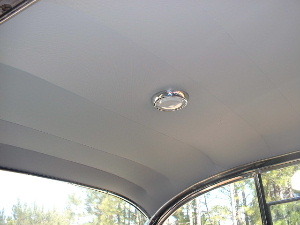 Dome light housing -- make sure that you don't have a short in the dome light wiring; because it will get hot and burn the new headliner if the wires are hanging loose. 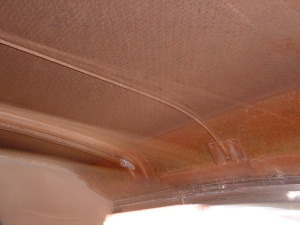 Replace the rods in the correct place in the new headliner and reinstall it. Attach the front and the rear 1st; then the sides; and put the trim back in place. And you should get a new, perfect headliner.